I don’t like trends. I always caution my clients that their new kitchen is the one place where they want to stay away from trendy choices. I understand that they want their new kitchen to look hip and happening to show off. 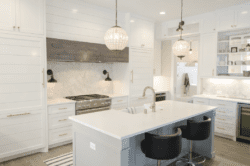 Yet, buyers’ remorse is a real thing, and no one wants the kitchen they’ve invested thousands of dollars in to be out of style in a few short years. 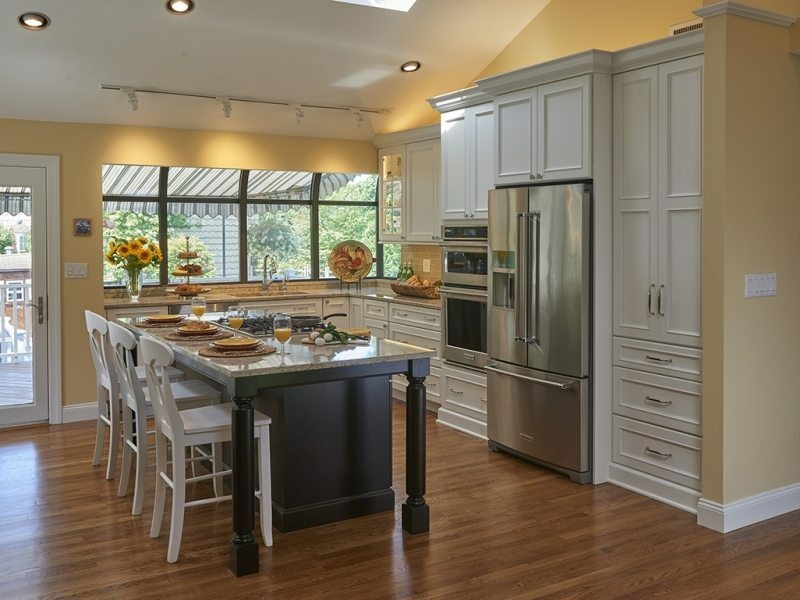 It’s a delicate balance when making choices for a kitchen remodel. But I’m happy to work with you to evaluate the 2018 trends in terms of what they can bring to your home, and decide which ones have staying power and which ones we are here today / gone tomorrow. Some of the “trends” in this list have real staying power. They are going to look good for as long as you want them to. In fact, I wonder how they are “trends” when they’ve been around as long as they have. There are pros and cons to removing upper cabinets, substituting the very trendy “floating shelves”. Yes, the open shelves look great when everything is clean and neat and arranged perfectly. The question is: do you use the dishes on those shelves? Or leave them out as display pieces only? And if they are display only, where are your “real” dishes? Homeowners want less clutter. They want a feeling of openness and having no wall cabinets helps to create this feeling. It makes the kitchen feel larger. Plus, homeowners say that items stored in wall cabinets that extend to the ceiling are “inconvenient” to get to. Most people store their glassware in the wall cabinet next to the sink or dishwasher. If that cabinet is gone, where to put the glasses? I suggest using a deep drawer (more on deep drawers later) lined with a nonslip rubber liner. Bottom line? In my opinion, doing away with wall cabinets is a trend, and one that would be expensive to un-do. A few floating shelves is ok as a design statement, but you are going to want those wall cabinets in the future. Here’s another way to think about wall cabinets vs. open shelves: open shelves actually came first and wall cabinets are the “trend”. Did our pioneer forefathers (and mothers) have wall cabinets? Probably not. Just a thought. 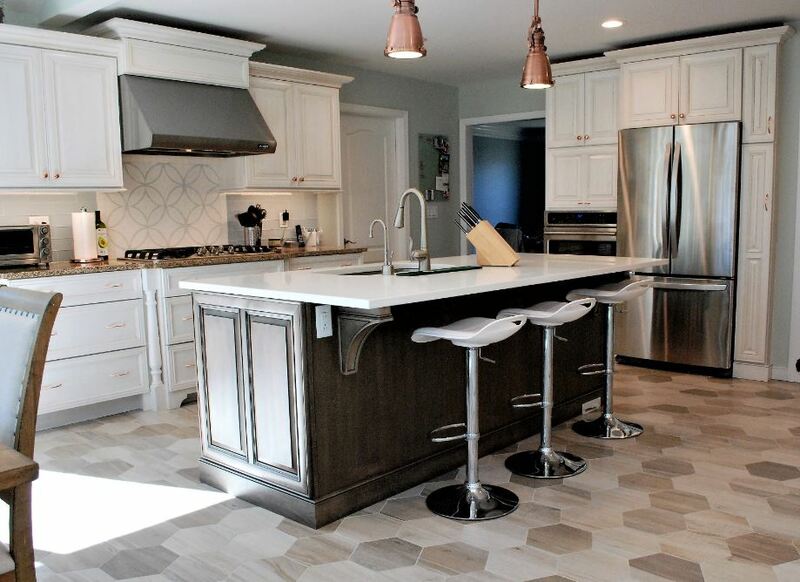 Quartz has become more popular than granite as a countertop material. And this is not going to go out of style. 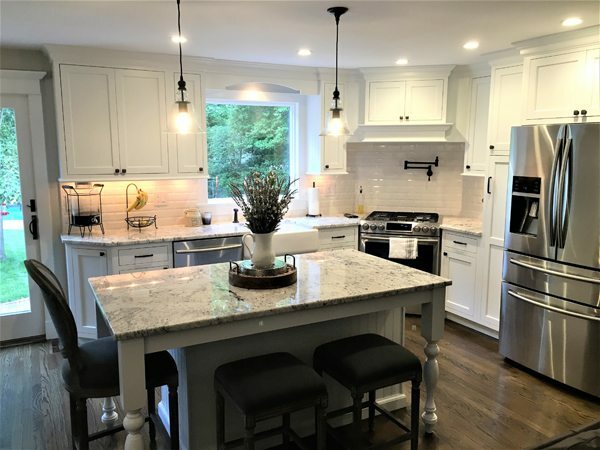 Quartz gives you a consistent pattern throughout your countertops, where granite has naturally-occurring irregularities, and you may not like where they fall in the countertop run. You can now get quartz with swirls and large veining that imitates natural stone, if you like that. 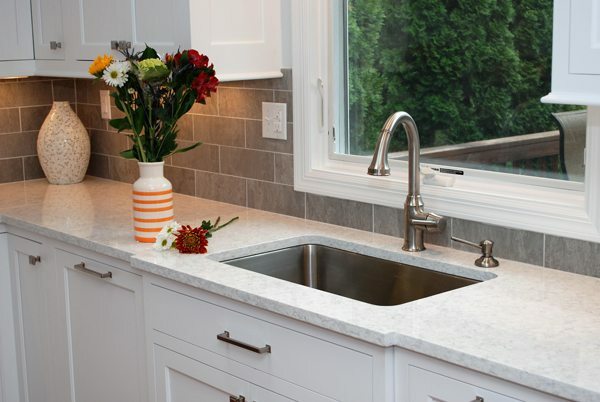 Quartz countertops are nonporous, resistant to heat, and aren’t affected by stains and scratches. The material is extremely hardy, it can last forever, is a breeze to maintain and is anti-microbial, making them the smart choice for families or busy cooks. I say white painted cabinets can’t be called trendy anymore. Now they are classic. The look may change as styles come and go, but the appeal of a white kitchen never dies. Kitchens with white cabinets can be anything from ultra-contemporary to farm house country to uptown chic. 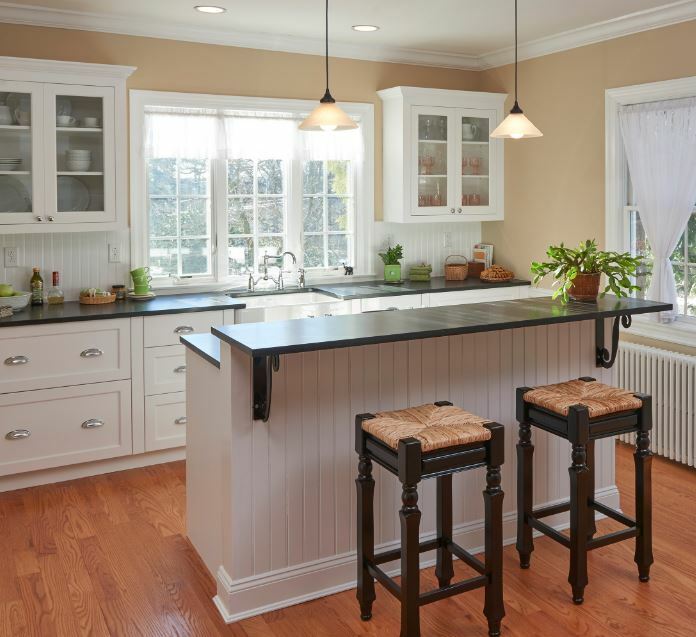 To break up an all-white kitchen, I recommend an island in a different paint color or wood stain color. Mixing finishes creates an accent piece and breaks up the white-on-white-on white. Grey is also a big cabinet finish color for 2018. Its modern, clean looks will remain a favorite for years, but I predict Grey as a cabinet finish color is a trend. Unlike white that will remain a popular cabinet color in 2018 and for years to come. White is not a trend. Drawback: If you’re a messy cook, then your mess will be visible to the entire space. But how often does that really matter? Floor plans for homes come and go, but I think the open floor plan is here to stay. Not a trend. A single level island makes much more sense if you actually cook and use the countertop as prep space. 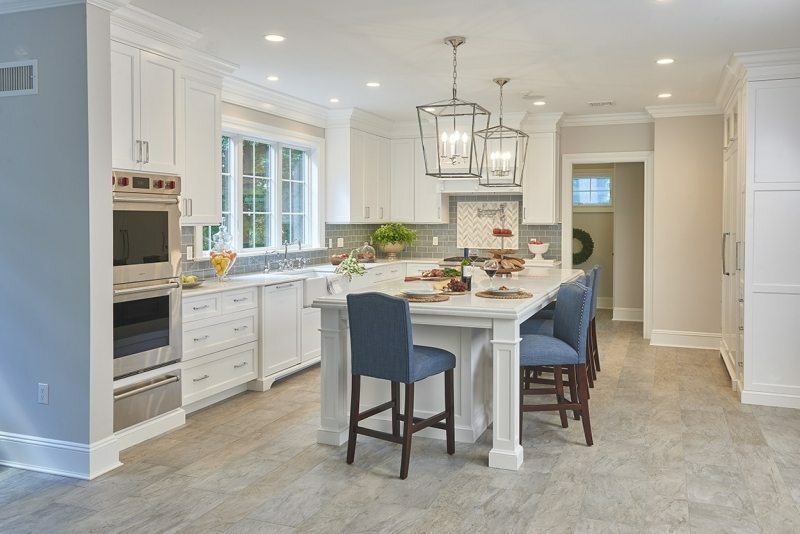 The 2018 single level island is larger and serves different uses. 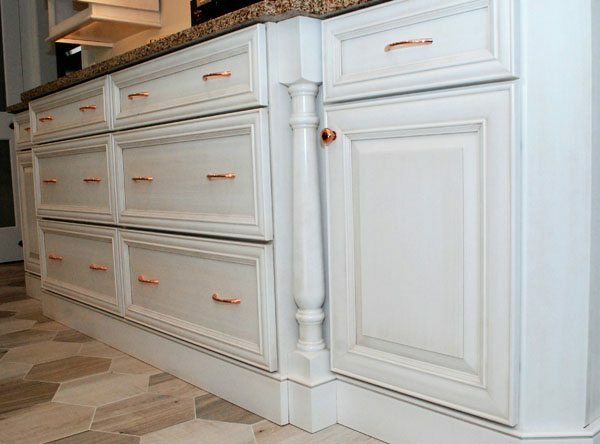 You will need this increased functionality if you decide to do away with wall cabinets. 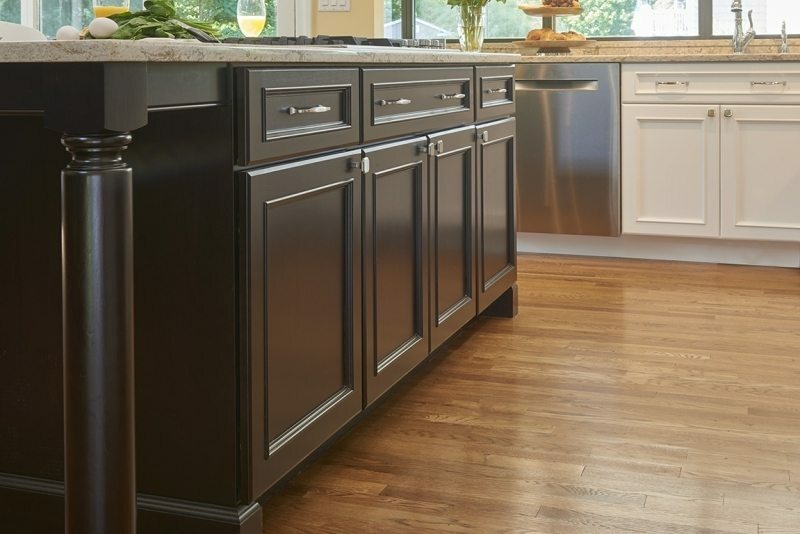 The larger island should have storage cabinets, with pull outs and roll outs and deep drawers and possibly multi-level drawers for flatware and utensil storage. They also provide seating, a place for kids to do homework and for casual dining. 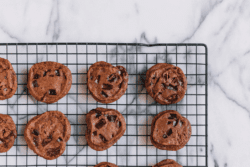 What kind of cook are you? Are you nice and neat and clean up after yourself as you go? Or are you a messy cook, who puts all her energy into the actually cooking and cleans up after? If you are the latter, then a dual level or staggered level island is for you. The single level island is a big part of the open floor plan. Not a trend. What did we ever do before kitchen designers decided to use deep drawers in their designs? Where did people keep their pasta pots and cake pans and all the other kitchen essentials that didn’t really fit anywhere else? Dish storage systems for deep drawers can store your plates and soup bowls — they are ingenious. Extra-deep drawers, especially by the range, make cooking and storage easy. 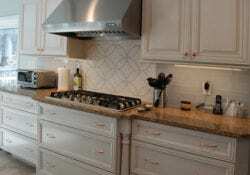 They’re more accessible than base cabinets and simple to integrate into a beautiful kitchen design. Are deep drawers trendy? They’re definitely a “must have” now, but they are practical and useful and this puts them in the Not a Trend category. LED lighting has joined the 21st century. It’s been softened and adjusted to provide different levels of cool and warm. LED lights can last thousands of hours and cost only pennies to operate. And the bulbs are cool to the touch, unlike halogen. LED lighting can appear in unexpected places in your kitchen – inside drawers and cabinets, under the toe kick, under wall cabinets. They can be motion activated so they light up when you walk in the room. 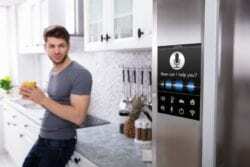 Or you can turn them on and off with a clicker switch. So many wonderful options. LED lights are here to stay, and they are definitely not a trend. It seems like every hardware item comes in nine or more different finishes, so picking one that you can live with for a long time is difficult. Polished silver or chrome has been around no matter how trendy other finishes may be. If you’re having trouble deciding on the hardware finish you will love for years, go with the classic polished silver for your knobs and pulls, hinges and faucets. Besides, polished chrome looks fabulous with white cabinets. Not a trend. What is trending now is gold-toned or brass hardware. This finish comes and goes, depending which celebrity designer features it in his show house kitchens. Hardware is easy to trade out if you tire of it after a while so making a trend-based decision about hardware isn’t fatal. My advice is to go with want you like. Not sure how this is even rates mention as a trend. Wood floors have been around forever. Stone was popular, but that was a trend. Nothing is better than wood for warmth, durability and classic good looks. It adapts to any style and pulls together the rooms in an open floor plan. The new porcelain tiles that look like wood make an excellent alternative if you’re not crazy about maintaining wood floors. These tiles look just like wood and never need waxed or give you splinters. Also a great alternative to wood is luxury vinyl planks. Wood floors or wood-look floors – Not a trend. To learn more about trends, here’s a couple links you can follow to read up.